Many people know of melanoma skin cancer as one of the swiftest and most deadly types of skin cancer. In truth, there are three different types of skin cancer, each with unique symptoms and degrees of peril. It is imperative that you know how to recognize the early signs of all types of skin cancer, including Basal Cell and Squamous Cell as well as Melanoma. Early detection and treatment are the keys to a successful recovery. Most importantly, you should take steps to stop skin cancer before it starts. Reducing your sun exposure and using sun block and protective clothing when you are in the sun remain the best way to prevent all types of skin cancer. The most common types are basal cell skin cancer, squamous cell skin cancer, and melanoma skin cancer. Excess sun exposure is by far the most common cause of all of these types of skin cancers. Basal cell skin cancer is the most benign and most common. Basal Cell skin cancer usually occurs on the face, neck, extremities and body parts that are exposed to the sun. It is a slow growing cancer that rarely metastasizes. Basal cell skin cancers can appear as a red patch of skin, a pearly bump, a scar–like lesion, or an open sore that does not heal. 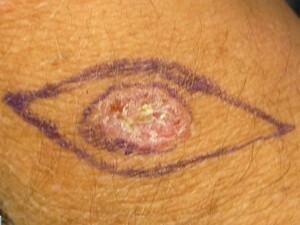 Basal cell carcinoma with plan of excision. Note the margin around the cancer to assure complete removal. The elliptical excision results in less distortion of the skin, often imperceptible, especially when put in natural skin lines. Squamous cell skin cancers are more invasive than basal cell types and constitute about 20 percent of skin cancer cases. Squamous cell skin cancers commonly develop on the lower lip, on the edge of the lower eyelids, and extremities, but can occur anywhere. Squamous Cell skin cancers grow rapidly and can metastasize to other areas of the body if not removed, becoming life–threatening. This type of skin cancer can appear as a scaly red patch that might scab or bleed, an open sore that does not heal, or a raised, wart–like growth. Together, basal cell and squamous cell skin carcinomas constitute the vast majority of skin cancer cases. When caught early, these types of skin cancers have about a 95% cure rate. Squamous cell carcinoma. Note the undefined borders and the large amount of skin it will take to remove it. This will require a graft for closure after it is excised and the free borders are verified by a pathologist. Melanoma skin cancers are the least common type of skin cancer but also the most dangerous and unpredictable. They can become very deadly, very quickly. Melanomas often occur in areas that have endured severe sunburns, though they can also occur in skin that has not had significant sun exposure. Melanoma skin cancer can also develop in moles that have been present for decades. About 30 percent of melanoma skin cancer cases develop in moles, and the other 70 percent in normal skin. They can occur on the bottom of the foot and even the retina of the eye. Typically, a melanoma skin cancer appears as a dark, multicolored, mole–like lesion that changes in character – perhaps enlarging, itching, or becoming irritated or irregular in shape. Melanoma skin cancers can also occur in multicolored patches. Unfortunately, melanomas are becoming more common – possibly as a result of smaller bathing suits being in fashion and many middle-aged people having sought deep tans as young adults. Indeed, some experts think that melanoma skin cancer is correlated with a few severe sunburns early in life, though this link has not yet been definitively shown. Melanoma is the most deadly type of skin cancer, but can be cured if caught early. 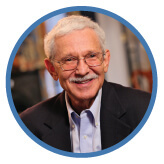 Early detection is extremely important – with all types of skin cancer, not just melanoma. The media have been covering five-year studies supposedly demonstrating the ineffectiveness of sun block in preventing skin cancers. These studies cannot be believed; they are inaccurate, incomplete, and ridiculous, as it may take 10 to 25 or even 30 years for skin cancers to develop due to sun abuse. Regular and proper use of sun block, hats, and long sleeves is a positive step in combating the development of skin cancers – but is not a complete substitute for reducing your sun exposure. Those of Irish descent or with very fair complexions and light hair and blue eyes should be particularly careful to limit their sun exposure. The higher concentration of melanin pigment in darker skin absorbs more ultraviolet radiation; therefore, those with lighter skin are more susceptible to injury and damage from the sun. In addition to taking preventative measures against the development of skin cancer such as reducing sun exposure and wearing protective clothing and sun block when in the sun, one should check your body for changes in blemishes and moles. Moles with irregular borders or mottled tones can be a sign of developing cancer and should be checked (or removed) by a doctor early on. Skin cancer can take many forms and can be hard to recognize; having a doctor (such as a dermatologist or a plastic surgeon) regularly check moles, and checking yourself in between doctor visits, can pave the way to early detection of skin cancer. If you have noticed any changes in your skin or an existing mole, contact our practice for an evaluation. Our surgeons can determine if cancer is present. Swift skin cancer treatment is key. Early skin cancer treatment in its superficial stages can mean the difference between deformity, life and death. There are two main skin cancer treatments. First, there are topical chemotherapy creams or gels, which are very effective for early pre-cancerous lesions when the cancer is limited to the top layer of skin. In this skin cancer treatment, creams or lotions containing anticancer drugs are applied to the skin – typically daily for several weeks. Topical chemotherapy tends to cause intense inflammation, but no permanent scars. The second treatment option is skin cancer surgery. Most often skin cancer surgery is performed under local anesthesia. Once it has been verified that all cancerous tissue has been removed, the site is closed with sutures. The affected skin, once it has been removed, is sent to a board-certified pathologist to be tested for cancer. 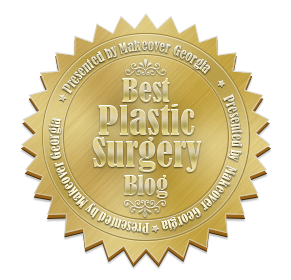 Our plastic surgeons utilize various removal techniques, each dependent on the size and location of the tissue to be removed. In most cases, small appearances of skin cancers can be excised in one visit, using local anesthesia. The surgeons at Finger & Associates work to remove cancerous skin cancers in ways that will minimize scarring. Another rarely indicated treatment for skin cancer is Moh’s chemosurgery. This was designed for recurrent cancers around the eyelids or nose, areas with little extra skin. This treatment is very costly, takes many hours to perform and usually leaves a cosmetic deformity. In our opinion and in that of many plastic surgeons and dermatologists, Moh’s Chemosurgery is being used in areas where simple excision would be better and in many cases a topical anti-cancer cream would suffice.